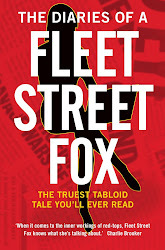 fleet street fox: News has to be new, Hugh. DEAR Hugh Grant: Very funny, but getting someone to say something they've already said to The Groaner doesn't move the phone hacking scandal on very much. Sorry. Good start though, excellent duplicity levels for a celebrity who usually just chucks tubs of baked beans at photographers and tells them he hopes their "kids die of cancer". Six out of ten.